If you are a mixing engineer and use any Mackie Control Protocol device (like Behringer X-Touch or the original Mackie Controller), you may have wondered at some point if the device could do something different, or if it could work this way, instead of that way, right ? Me too and that’s the reason I was hunting for a solution to improve my controller and my workflow. When I bought my X-Touch and the Extender to use in Cubase, I mostly used it to control pan and volume because editing plugins, channel strips or other things is way too much pressing buttons and rotating knobs so I always ended up using the mouse for those things just because it was faster. Someday I had the idea to use Pure Data/Max to manipulate the information that my device was sending to cubase and then I started building this patch and now my workflow is WAY faster. I’m explaining in detail in this video what I have done in the patch to customize my controller. Every time I click on the Next Bank/Prev Bank buttons, Cubase also selects the channel so the screen can scroll to the same channel I’m seeing on the controller. Every time a click on Sends, it will press FLIP for me, because I like my sends on the faders and not on the knobs. And everytime I leave the Sends page, it will FLIP back. Customize the wheel to do whatever you want, like clip gain, call macros, fade in time, fade out time. Editing plugins now is a breeze, you just have to click the corresponding knob to open the window and you are ready to tweak the plugin. You don’t need to press the Plug-In page button anymore, select the correct slot (IFX Slot) and then press the page button. Max is doing this automagicaly (HUGE time saver and fun). Same with channel strips. To add a channel strip module you just have to press a button, same thing to edit a particular strip module, just press a button. No more rotating knobs until you find the correct strip you want to edit. I have not tested this with another Mackie Controller, but it should work ok, since they are sending and receiving the same information. The patches (for Max and PD) are a bit different from the video because I fixed some bugs right after I made the video, but they work exactly as shown. If you are on windows, be sure to make the link to forward the MIDI data from Port B (the Main unit) to Port E (if you are on Max) or Port 1 to 4 if you are on PD, as I explain in the video. You will notice that the PD Patch is more complex than the Max patch. It’s because in PD I have to disable some note off for some notes but not for others. In general, I had to make more things in PD to achieve the same result I had in Max. If you are not Cubase user, I think you can take the same idea here and modify the patch to do whatever you want in your DAW. The basic idea behind this whole patch is to make Max press some buttons when you press others, or rotate some knob X times to do something. Let me know in the comments if it worked for you or what you did to customize it to your DAW. If you are using PurrData (which is an “extended” version of PureData) instead of the Vanilla PD you will need to use the -legacy startup flag otherwise you will have problems with the pitch bend (channel faders). Need a mixing Engineer ? 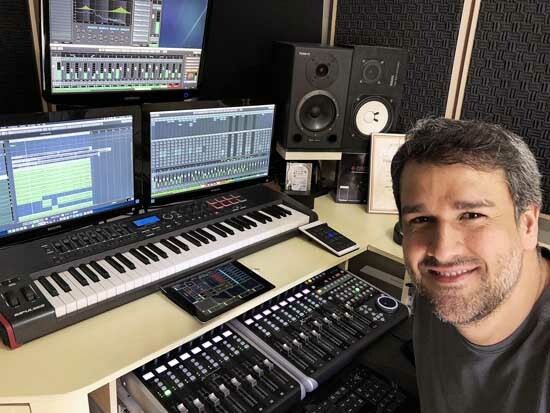 Are you looking for a mixing engineer for your next project ? I’ve been mixing for a long time and have experience in different genres. It will be a pleasure to talk to you about your upcoming project or if you want just to say hi! Hi. I’m trying to setup my X-touch + x-touch extender following your youtube video. Everything seems to work fine, but there is something i’m not doing right. Every key I press, beside doing the function is supposed to do, I hear a piano note. Sometimes a chord. I guess is something simple but I can’t find what it is. Any idea of what I’m missing? Thanks for your work. If i’m not mistaken, this happened to me at some point. Are you on macOS or Windows ? Max or Puredata ? I think that in my case, what happened was that in Max, in the MIDI Setup, the output “AU DLS Synth 1” had the same letter as one of my controllers (don’t remembter if it was the Main unit or the extender) so, everytime Max was sending information to cubase, it was also sending information to this apple synth. Try to uncheck it and change it’s letter to “-“. Let me know if it worked! Thanks Paulo! Now it works as it should! Let me tell you what I did. I work on Mac/Cubase 9.5 and use Max. When I checked midi setup on Max there was no letter assigned to AU DLS Synth 1. What I tried is to assign it to letter “e”, and then change it to “-“. A couple of questions more if you don’t mind. Do the Function keys on the right side of X-Touch work for you? I can’t make them work. Otherwise I have my first generic remote created. Insert editor opens, but some of them don’t react to edition. Although they all react to bypass, some of them don’t follow the encoders. It does work in the other way. If I tweak them with the mouse encoder lights follow. I assume is a problem of some plugins. As for the jog wheel. I works…sometimes. I created a second generic remote. Input “IAC Bus 3”, output, as I don’t have any Steinberg controller, I assume is X touch Int…?? I spin the wheel and it works two or three bars, then it stops working. If I wait 5 seconds or so it works again. Same with the scrub button. Seems to be kind of “accumulation of data” thing… Maybe the problem is I don’t have the Steinberg CC Controller? Anyway thanks again for your work and your attention. The function keys works perfectly here.. I just had to setup it inside the Mackie Controller window to do whatever I want. Strange that it’s not working with you. The Plugin editor works with me all the time.. The only thing that sometimes happens is that it not always open the plugin window which is a cubase buton.. I have to go to the Generic remote and press “RESET” and now it works. For the plugins I use, the remote control with the knobs works everytime. What are the plugins that are not working for you ? Did you try using the “Remote Control Editor” to customize the plugin parameters on the X-Touch ?? And regarding the scrub, I think you can leave the Output as “Not Connected”. Give it a try.! Well I think I have it working on Cubase 10, Windows 64bit, using Puredata and an Icon Qcon ProX and Qcon ProX extender. So that is almost entirely the opposite setup to Jose above which I hope proves it will work cross platform. Go into Studio > Studio setup > Midi Port Setup. Now everything should work without triggering random notes or fader detunes etc. Thanks for this tip Darren!!! Can this work for other DAW’s such as SONAR? First, congratulations. What an impressive job you’ve done! I’m thinking on buy a Behringer X-touch or an Icon Q Control, and your configuration will help me to maximize the work with the unit. 1. Can the program be configured to send cc controllers to midi tracks? I want to use the faders to send modulation and expression messages while I’m composing, and switch later to use these same faders as volume control for audio tracks. Is it possible? 2. I’ve read that Behringer has launched a tool to midi map the X-compact, and I suppose it should also work with the X-touch. Have you explored it? Do you think it could be used instead the max software to simplify the configuration? Hey Francisco! Glad that you liked! 1- There is no way to configure (without messing .A LOT with MAX or PD) X-Touch to send MIDI CC data. You can take a look at X-Touch compact that im almost sure you can do that with it. 2- I don’t think that this software will work on X-Touch. The compact version has a MIDI mode that the X-Touch doesn’t. I never used the Q- Control but it seems to be better built and more beautiful (and should work the same way as X-Touch) but it’s way more expensive! Hi PG, many MANY thanks for the effort you have put in this! You very much helped me understanding the principles behind this ‘remote controller mystery’. – Display under rotating knob 1 shows IFX 1. – Pushing that button opens the currently used IFX 1. – Choosing a different plugin slot, let’s say 7. – Now pushing knob 1 opens plugin of slot 7. Since Cubase has 16 inserts I don’t want to use 16 ‘hard coded’ buttons for every insert. By the way, I’m running X-Touch (without extender) on Cubase 10 with Windows 10. Hey man.. glad that you liked! Thank you anyway! So far I found out that in Cubase 10 it is possible to assign X-Touch input and output to the Mackie Control as well as to a Generic Controller. There seems no conflict/exclusion so far and I don’t see a need for LoopMIDI. I can open plugins in slots 1-8 with knob buttons 1-8 and plugins 9-16 with F1 to F8 for example.